Dawn, The Window. 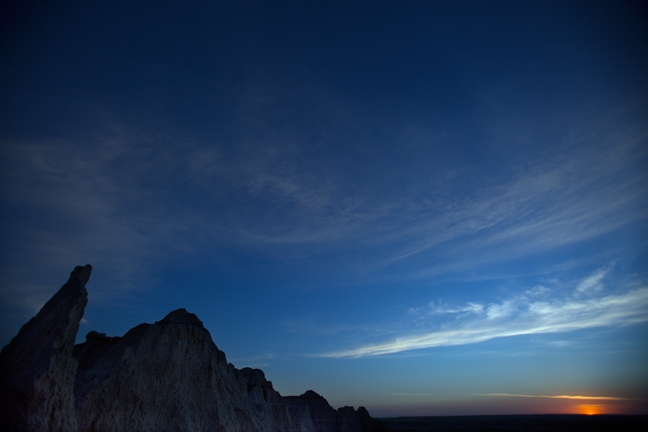 The Window is an opening in Badlands Wall, a 100-mile long natural barrier that has been sculpted into pinnacle and gullies by forces of water for the past half million years. It erodes away an inch or more in some places each year. 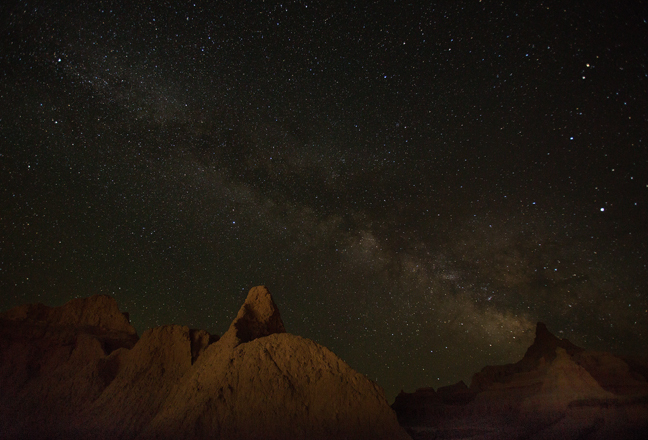 The Oglala Lakota Nation, the second-largest American Indian Reservation in the United States, co-manages half of Badlands National Park. 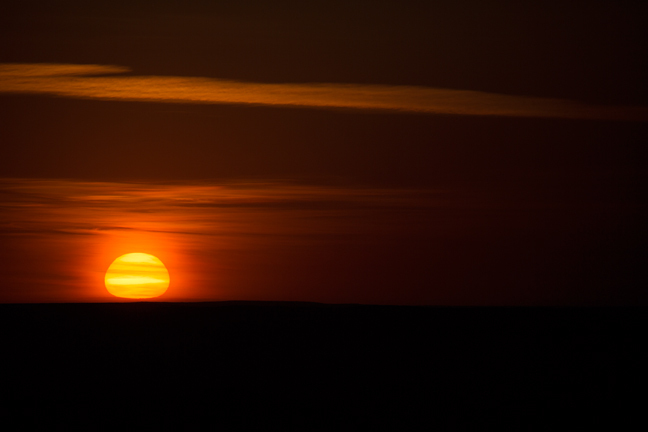 It was at Stronghold Table that the final Ghost Dance took place in 1890, just a few weeks before more than 150 Lakota were massacred at Wounded Knee, 25 miles to the south. 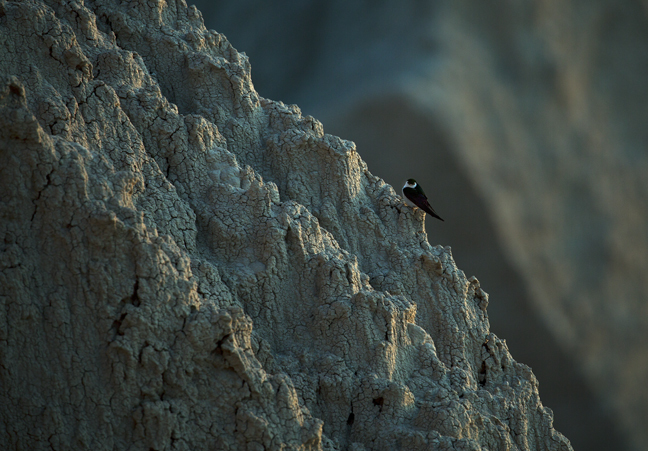 A Tree Swallow rests on a ledge as the first rays of sunlight illuminate The Wall at the Window. The first rays of sunlight illuminate The Wall at the Window. 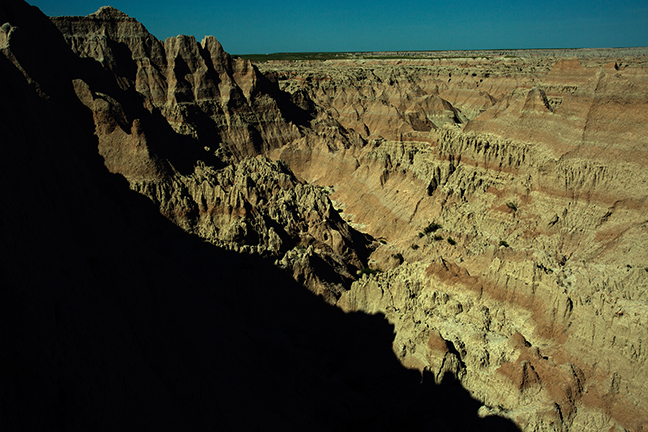 Erosion began in the Badlands about 500,000 years ago when the Cheyenne River still flowed from the Black Hills into the Badlands. The landscape as seen from the White River Valley Overlook is roughly half geologic formations and half mixed-grass prairie ecosystem. 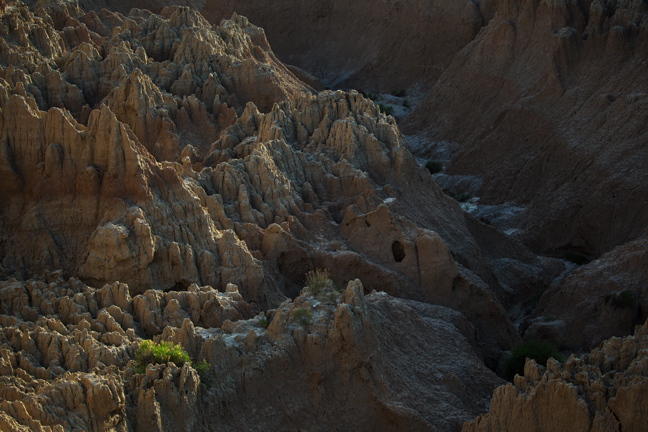 The Badlands were deposited in layers beginning during the late Cretaceous Period (65-75 million years ago) through the Oligocene Epochs (26-43 million years ago). The lighter colored Sharps Formation was deposited by wind and rain as the climate cooled 28-30 million years ago. A thick layer of volcanic Rockford Ash, deposited 30 million years ago, forms the bottom of the Sharps Formation. 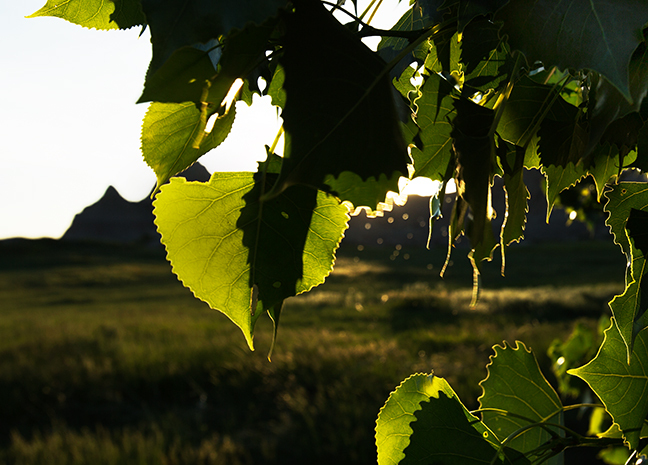 The sun sets behind cottonwood trees across from the Ben Reifel Visitor Center. Cottonwood trees are dioecious. Flowers on the female trees are pollinated by wind-brine pollen from male trees. When the seed pods open, "cotton" is spread by the wind. The sea drained away with the uplift of the Black Hills and Rocky Mountains, exposing the black ocean mud to air. The upper layers were weathered into a yellow soil, called Yellow Mounds. The mounds are an example of a fossil soil, or paleosol. 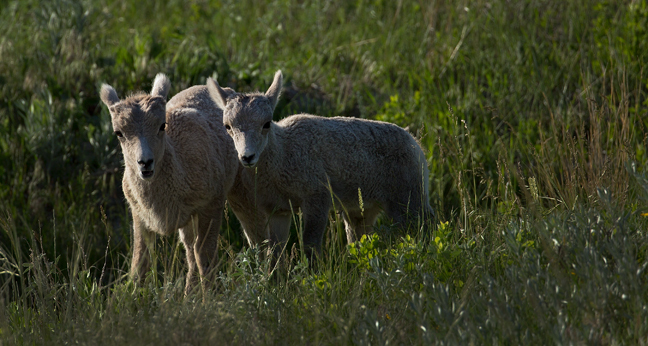 Two yearling Big Horn Sheep graze below the Pinnacles Overlook in the evening along Badlands Loop Road. 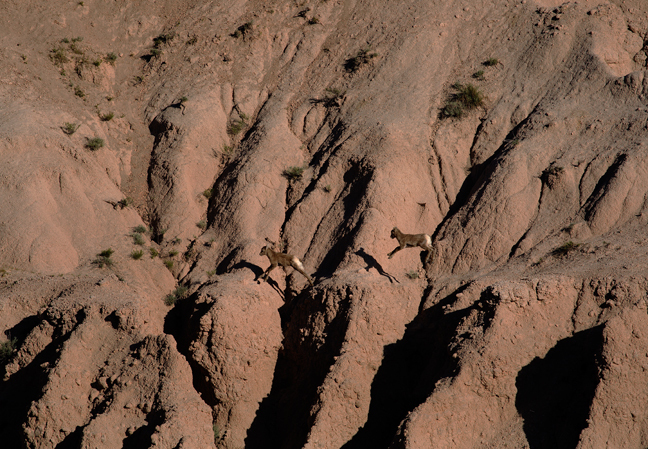 Two yearling Big Horn Sheep romp across the hillside just southeast of the Pinnacles Overlook in the evening along Badlands Loop Road. 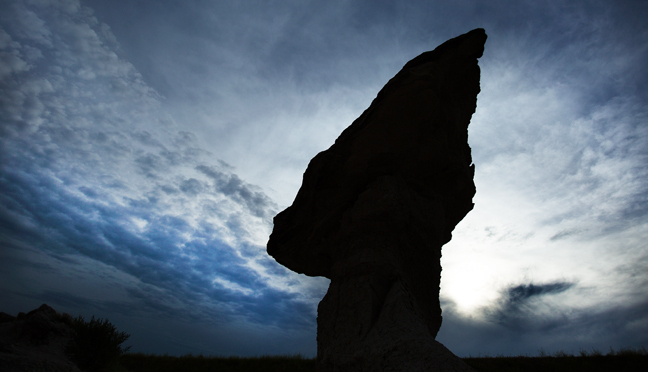 We climbed down the embarkment to photograph the caprock toadstool or "hoodoo" at the base of Norbeck Pass, one of the places where the road crosses The Wall, a thick ridge more than 100 miles long, leading from the upper prairie to the lower prairie. Unfortunately, clouds moved in to block the desired warm evening light. 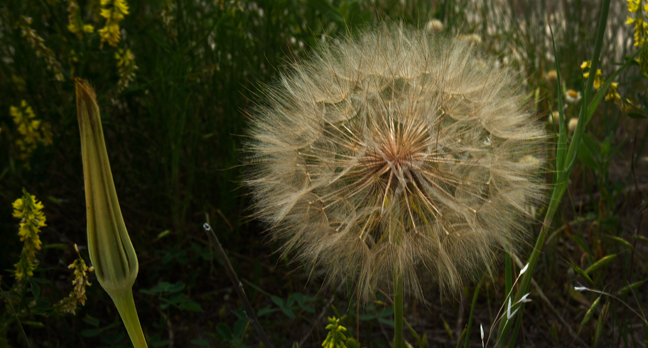 On the way back up to the car, we found a Western Salsify seed head at the base of Norbeck Pass, one of the few places in the Park where the road crosses The Wall, a thick ridge more than 100 miles long leading from the upper prairie to the lower prairie. 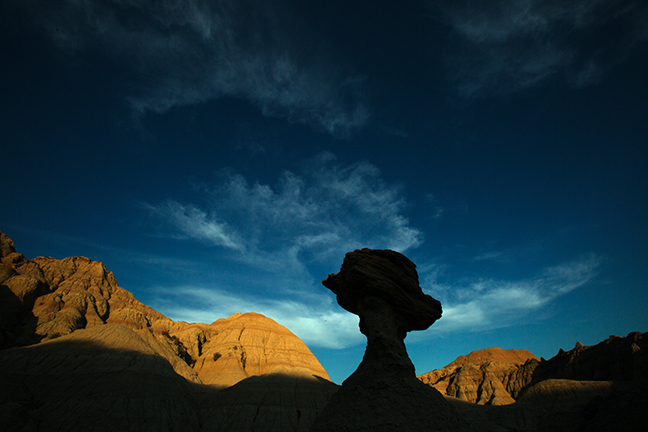 We returned the next night to take the photograph of the hoodoo I had envisioned. When the sun dips below the raised road embankment, the caprice toadstool is in shadow while the striated backdrop is still illuminated by the soft evening light. 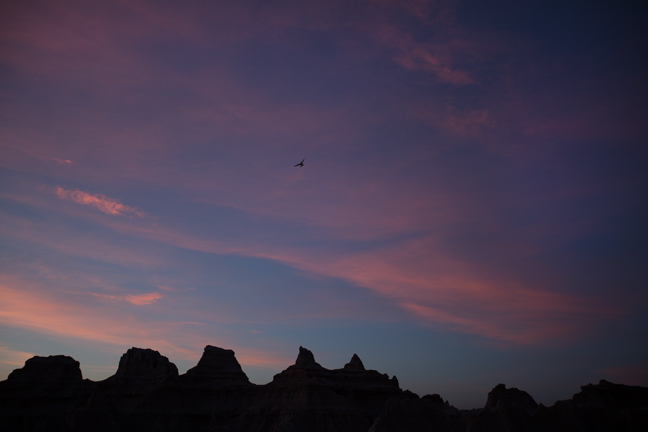 The pass is named after Peter Norbeck, who was elected governor of South Dakota in 1916 and 1918 and U.S. Senator in 1920, 1926, and 1932. 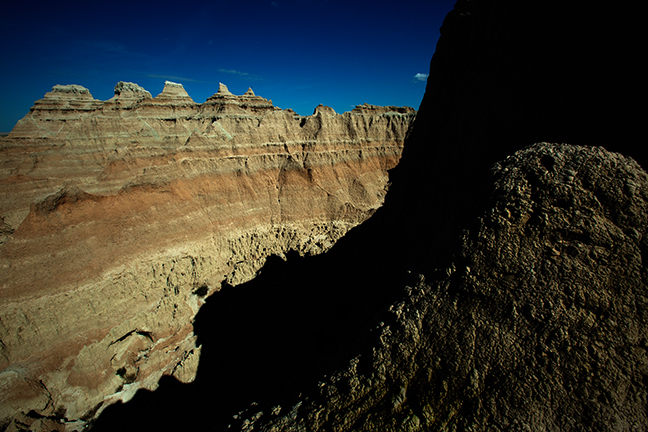 Norbeck sponsored a joint resolution requesting the establishment of a national park in the Badlands in 1909.